This is part of our ongoing series of blog posts about race, racism and law enforcement in communities of color. After watching the horrors in Ferguson, Missouri, unfold only a few miles away from where I live, I began looking closely at social justice strategies as a way to heal my community. Much of psychology has been involved with issues of social justice, defined here as the act of exploring inequalities within a system to promote human values of equality and justice. Competent clinicians approach their clients as cultural beings who exist within systems and contexts. One of the first things that I observed during my crisis work in Ferguson (the first few days after the shooting of Michael Brown) was the enormous amount of anger and frustration evident in the community. Since August 9, the world has become familiar with the racial profiling and unequal treatment by law enforcement in this small community. In Ferguson, I’ve spoken with many African American individuals who have reported numerous instances of being stopped by police and searched for no apparent reason. Statistics show that Ferguson police are much more likely to stop, search and arrest African American drivers than white ones. Last year, African Americans, who make up a little less than two-thirds of Ferguson’s driving-age population, accounted for 86 percent of all stops (Moskop, 2014). When stopped, they were almost twice as likely to be searched as whites and twice as likely to be arrested, though police were less likely to find contraband on them. What a staggering statistic that highlights the level of injustices that many African Americans in this community live with each day. Many individuals are experiencing symptoms of posttraumatic stress disorder as a result of the traumas and/or injustices that they have experienced. Many Ferguson residents — especially those living in the Canfield Apartments where Michael Brown was killed — have been traumatized by this situation. They have also experienced traumas since Brown’s death, such as being tear gassed, fired on with rubber bullets and being attacked by police dogs just for peacefully protesting in their own community. Last month, I conducted a music therapy/hip-hop therapy (Tyson, 2002) program in the Canfield Apartments. Hip-hop therapy is a social justice approach that uses songs and lyrics to identify and discuss inequalities and injustice. We examined the lyrics of relevant hip-hop songs and discussed how the words reflect the frustration and trauma that parallel those felt in the Ferguson community. It was a powerful event that allowed us to bring together youth, as well as adults of all ages who can all understand the feelings that serve as the groundwork for the songs. Innovative clinical interventions are needed that draw directly from the culture and lives of young people. Hip-hop therapy is a community-driven approach to mental health and serves as an example of a culturally specific mode of treatment. Social justice strategies allow us to examine the role of racism, prejudice and social class, all salient factors that contribute to racial profiling. If we take a social justice approach to our work, we will address these systems and how they affect the well-being of our clients. I’ve spoken to many people in Ferguson over the past few weeks and many of them are frustrated, angry and need an outlet for these emotions. 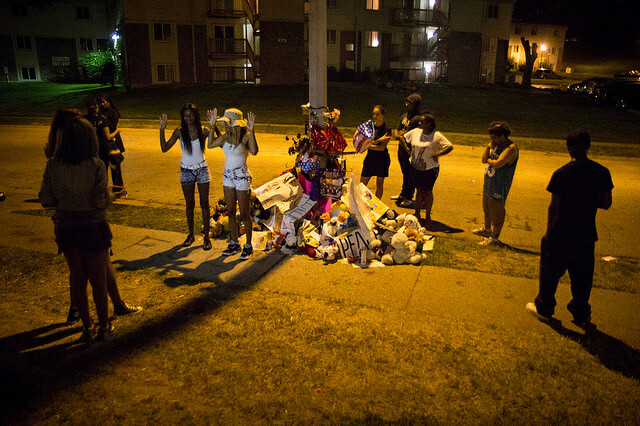 I’ve seen the parents of Michael Brown struggle as they attempt to proceed with their lives. My heart goes out to them as parents, because I have two sons and can’t imagine their lives being taken at such a young age. As psychologists, we also educate our clients, and there are many steps that can be taken to empower clients within the communities that we serve. I work in Ferguson, Missouri, and other areas of St. Louis; however, we all know of cities just like Ferguson where our work is needed. First, recognize where you might be privileged and where you are oppressed. As a clinician, you cannot initiate a social justice strategy without understanding these elements. Incorporate racism, sexism and classism into discussions with clients. Encourage your clients to explore how these factors have affected their lives. Encourage your students or clients to write letters to their local politicians and discuss changes that they would like to see happen in their communities. Teachers, encourage your students to engage in political action. This is the time to disperse information on college campuses and for students to align with each other over causes that matter to them. Introduce books at home or in the classroom that highlight characters that stood up for their beliefs (e.g., The Lions of Little Rock, Warriors Don’t Cry or Ruby Bridges Goes to School: My True Story). Psychologists need to work in collaboration and form equal partnerships with community and spiritual leaders. In many communities like Ferguson, spiritual leaders are highly respected and thus can help establish your credibility. My fellow psychologists, this is the time for us to incorporate a social justice perspective into our work. It is really about acknowledging the fact that oppression exists in many communities, it negatively affects the mental health of some of our clientele and that we need to balance both individual counseling and advocacy in our work with clients. In other words, as psychologists, we are in positions of power and can be a voice for those who historically have been marginalized and oppressed. I challenge you to use your positions and voices to speak up. The future of our communities depends on it. Enns, C.Z., & Sinacore, A.L. (Eds.). (2004). Teaching and social justice: Integrating multicultural and feminist theories in the classroom. Washington, DC: American Psychological Association. Tyson, E. H. (2002). Hip hop therapy: An exploratory study of a rap music intervention with at-risk and delinquent youth. Journal of Poetry Therapy, 15(3), 131-144. Ware, M.E., & Johnson, D.E. (Eds.). (2000). Handbook of demonstrations and activities in the teaching of psychology (2nd ed., Vols. 1-4). Mahwah, NJ: Erlbaum. Dr. Jameca W. Falconer is an accomplished counseling psychologist, educator, entrepreneur, and civic leader. She is currently the counseling psychologist at Logan University. With clinical expertise in geriatric psychology, Dr. Falconer is one of the leading providers of psychotherapy services to older adults in St. Louis. Prior to starting at Logan University, Dr. Falconer was an Assistant Professor of Psychology at Southern Illinois University Edwardsville. Dr. Falconer has also served as Adjunct Faculty at Southern Illinois University Dental School, Webster University and Maryville University. She has been the recipient of teaching awards for her stellar performance in college classrooms and was recently nominated for the prestigious William T. Kemper award for Excellence in Teaching at Webster University. Dr. Falconer has research publications in The Journal of Black Psychology and Psychology of Women Quarterly as well as book chapters, and various newspaper articles. Dr. Falconer is a past president of the Association of Black Psychologists (Saint Louis Chapter), and President of the Tougaloo College Alumni Association (St. Louis chapter). Her leadership in both organizations has helped to re-engage members and stimulate more community outreach efforts. Much of Dr. Falconer’s community involvement has focused on increasing the awareness of mental health conditions and decreasing the stigma associated with mental health in communities of color.